for periodic research and resources. Innovation isn’t all AI and blockchain. It is about defining challenges and opportunities and then thinking creatively to develop game-changing solutions. For law firms, one such challenge is lateral retention. 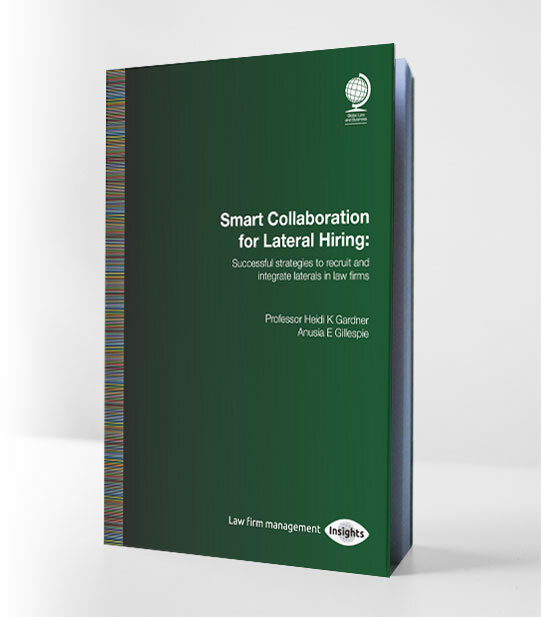 In my new book, co-authored with Dr. Heidi K. Gardner, we offer forward thinking law firms a research-based approach to the increasingly challenging process of hiring and integrating lateral lawyers and business professionals. Sign up for my newsletter to receive period resources on the broad function of innovation in law. The proposal for structured, behavioral-style interviews in stage 2 of this book’s 3-stage process makes so much more sense than ad-hoc interviews with whatever associates and partners have the time. I definitely recommend this book for lawyers and law firm professionals concerned with recruiting and retaining top talent! As a lawyer who has moved laterally between law firms, I have seen the approach of various firms in how they recruit, hire, and integrate lateral associates directly. I appreciate firm processes that ensure smooth transition and integrate lateral hires into a firm by connecting laterals with the right people and resources to be productive and efficient. Law firms should implement the espoused best practices, including these robust social science-backed recommendations, for both partners and associates. Join for periodic research and resources.